The tentative programme od the workshop (last update: 4.03.2008). There are trains from Kraków Główny train station to Zakopane few times a day, the trip takes 3-4 hours, the cheapest version costs about 18,5zł/4,5eu (see details - from Kraków Główny to Zakopane). There is a train from Kraków Airport do Kraków Główny train station every 30 min, the trip takes 15 min and costs 4zł/1eu (see details - from Kraków Balice to Kraków Główny). There is a train from Warsaw Central Station to Kraków Główny Station every 1-2 hours, the trip takes 3 hours - epsilon and costs about 91zł/23eu or 5 hours + epsilon and costs about 44zł/11eu (check details - from Warszawa Centralna to Kraków Główny). There is a direct train Warsaw-Zakopane (from Warsaw Central Station) a few times a day, the trip takes 6 hours - epsilon and costs about 94zł/24eu or 10 hours and costs about 55zł/14eu or ... (check details - from Warszawa Centralna to Zakopane). To guarantee your Hotel reservation at the conference venue, Hyrny Guesthouse, we ask you to pay a deposit. You can either make a direct payment of 55 EURO to the bank account given in the email, or you can pay by credit card via Paypal, as follows: When clicking on the big yellow button below you will be taken to a secure site where you can completete payment using a credit card. On that site you will have to use the link under the heading. If you don't have a PayPal account, use your credit card or bank account (where available). Participants can make reservations by their own or contact with Asia Mazurkiewicz (after Feb 6) or Andrzej Okołów (before Feb 6). Please remember to also send an email stating your name and your arrival and departure date. 10 minutes of walk from the conference guesthouse (Hyrny). 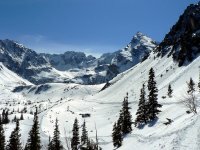 Zakopane is a tourist and ski resourt in the Tatra Mountains in Poland. During the workshop it will be also possible to ski, snowboard (down hill, 2000m - 1000 m) or walk in the national park. For more information about Zakopane see Wikipedia, www.ezakopane.pl, Zakopane-life.pl and Zakopane.pl.